Our Firebaugh movers come with all the moving services you need to get you safely into your new home. Our clean-cut student-athlete Meathead Movers are trustworthy and dedicated to fulfilling all your needs. Choosing our professional Firebaugh movers is a great way to ease the stress of making the transition to your new home. Situated on the west side of the San Joaquin River, Firebaugh is a small community nestled in California’s Central Valley. Like most cities in the area, the economy is driven by agriculture. Families planning on moving to Firebaugh will find a friendly community located just 20 minutes from Interstate 5. If you’re planning on calling this town your home, you’re sure to enjoy the beautiful agricultural lands that surround the area and the many recreation opportunities that Fresno County affords. The town lies less than two hours from world-famous Yosemite Park. Thanks to its convenient location on State Route 33, residents and visitors also enjoy easy access to nearby parks and wildlife reserves. The city of Firebaugh is home to a small commercial center, and the city’s leaders have created a development plan to encourage greater business growth. Residents can also enjoy shopping in the city’s downtown district or can head to Fresno, for an even greater array of shopping opportunities. Sporting events, concerts and other special events can also be enjoyed in Fresno. In addition to boasting beautiful agriculture lands, Firebaugh is also a predominantly Latino community where Hispanic cultures are embraced and celebrated. Families moving here will find the community hosts many kid-friendly events throughout the year. The community may be small, but it’s a well-knit and inviting one that will have you feeling at home in no time. When you hire Meathead Movers as your Firebaugh movers, you’ll enjoy the peace of mind of knowing that professional clean-cut student athletes are handling your possessions. When we are not carrying your belongings, we even jog to make sure that we are making the most of your time. We’re proud to help you with every facet of the moving process from packing to getting settled in to your new home. Our Princess Packers are here to help you get your possessions ready for the move, while our moving concierge can connect you with local service providers for all your moving needs. We know that both our local and long-distance moving services are top notch, which is why we offer a 100% satisfaction guarantee to our customers. 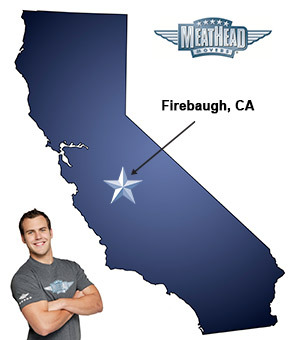 Choosing Meathead as your Firebaugh movers of choice is the best way to make a smooth transition to your new home. From local and long-distance moves to on-site and commercial moves, Meathead Movers can help you out with any of your moving needs. Contact Meathead Movers today for a free no-obligation moving quote and learn how we can help you on your next move!